Saturday, November 25th the theater “Teatro Nuovo Giovanni da Udine“ will be the perfect venue for bringing together supply and demand, indeed the almost 70 firms enrolled to the event and the young students and graduates of the most prestigious athenaeums of Friuli Venezia-Giulia will meet here. A unique and important event, organized and made possible by ALIg, the Association of graduates in Engineering Management at the University of Udine, with the aim of facilitate the transaction between the end of the course of study and job placement. As Supporter of the event, in line with the corporate philosophy that countersigns us and always pushes us to look for the best young talents, also Alfa Sistemi‘s staff will attend to the Fair of the job. 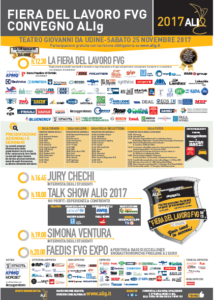 Come to listen our company presentation that will be held at 13.30 near the “Sala della Biglietteria”, and come to visit our stand where you will have the opportunity to have a short interview… you could be the next one to join our team! Don’t lose this chance, sing up and attend to the event!